Glitch Art, what is it? Elle: Briefly, Glitch Art is deliberately creating errors or capturing bugs in technology and then turning it into art. Often it’s digitally corrupting data by manipulating it, then displaying it visually or sonically. Elle: Seeing some examples online, it really caught my attention. I had no idea at the time how it was being done. I like it visually. The idea of transforming something by introducing error or essentially misusing software to create artistically appeals to me. 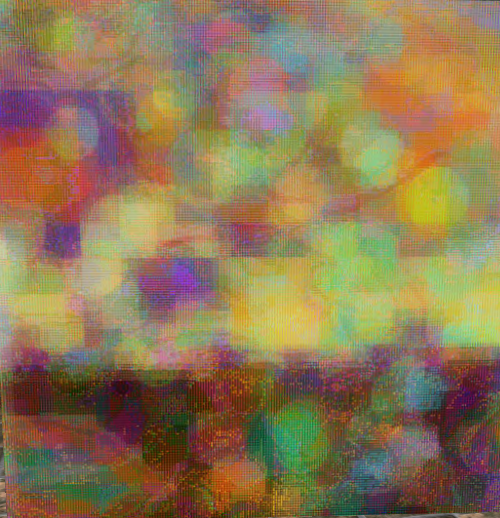 For example the first glitch art I tried I used Audacity, which is for editing sound files, like mp3s, to transform some of my real life photography. There is an element of that in most of my work, combining things, going from one type of media to another until I find something I like. Elle: It’s been interesting, it’s the first time I’ve shown this type of work. I’ve been pleased with displaying and using it in SL. People have been positive and kind. I experimented with mapping textures onto objects with a couple of my pieces in SL. I have minimal experience building so it’s been a learning opportunity and I enjoy seeing how objects come out. My SL and RL have a tendency to mix and converge in my work. SL is prone to glitch itself, I think it helps to have an appreciation for that. It’s been an enjoyable experience, especially with all the different artists and disciplines present. It has a nice energy to it. It is great to see talented people express themselves in so many individual and creative ways. I like my neighborhood and encourage people to come look around. I think Elle Thorkveld’s work is really interesting and the concept of Glitch Art is one that has a lot of playful artistic possibilities. Take a walk around MU and visit Elle’s Studio [Tullia 14]. Thanks for writing this! Elle always inspires me. The use of color in her work is so amazing. I’m really glad to see her featured and learn about glitch art. When you wrote about her mapping her art onto 3D objects it made me say…..hey! Why not ask her to texture one of my prim towers with her vibrant art. That would be joyous! Thank for your kind words Neeva (and Art too). Yes, I’d be happy to texture one of your wonderful towers.